Our approach to EFI systems and tuning was a purely practical angle, leaving out some of the super technical details that may tend to bog some down, and just trying to write about what the reader would need to know to make their project a success. We cover all the basics, and then dive into tuning on the track and on the dyno, with very practical ‘how to tune’ type walkthroughs (fuel and ignition timing) to help the reader understand the process and remove the mystery. We also cover some common, and not-so-common troubleshooting scenarios and finish with case studies of customer cars, demonstrating some of the unique issues and questions one might need to overcome and answer. 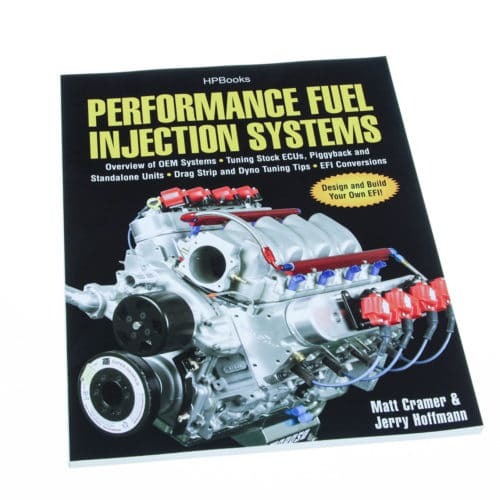 Performance Fuel Injection Systems is not a MegaSquirt-specific book but does speak from our experience. Many of the tuning software screenshots and other references/images will be HIGHLY recommended for anyone diving into a MegaSquirt project, and highly educational for someone diving into ANY EFI project. If you’re doing a MegaSquirt project, Performance Fuel Injection Systems serves as the perfect practical compliment to the product manual. How much MegaSquirt content is in this book? This book covers more general tuning principles than ECU specific settings. It is separate from the MegaSquirt documentation and more focused on the approach to tuning. Can I get a signed copy? Yes, just request it in the Comments field when you order. This book assumes you have some basics of mechanical knowledge, but it is aimed at a relative beginner to EFI tuning.